HobbyTown fixture sale: Roger will be auctioning off some store fixtures, mostly magazine and book racks, during an upcoming CASM meeting, and CASM will get half of the money from the sale. Facebook contest: There will be contest on the CASM Facebook page. The technical aspects and rules were discussed, along with possible prizes. The contest is set to run between the January and February 2013 meetings. 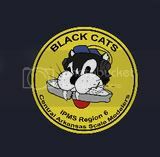 It is hoped that we will have more participation, particularly from members outside of the Central Arkansas area. Future use of other social media outlets, such as Pintrest, was also discussed. Future Seminars: Ideas for future seminars were discussed, and the pros and cons of charging a fee for the seminars were debated. It was decided that fees should only be charged if CASM supplies materials. Boy Scouts: Ken was contacted by Ken Leslie about the possibility of members of the Boy Scouts attending a CASM meeting for their explorer project. Ken will follow up on this for more information. Future Goals: The goals for the Executive Board for the next 2 years were discussed. These included increasing membership in IPMS, pursuing a dual charter with AMPS, and continuing to provide outreach to the modeling community in our area and via the internet. IMPS Charter: Ray shared with us that the Charter renewal has already been completed. Scratching Post: Tom discussed his ideas for revamping the Scratching Post as an interactive publication about modeling, written by modelers with the purpose of showcasing and expanding the modeling hobby. The Scratching Post will include areas for readers to leave comments, links to demo videos, and to Forum threads. Links to the Scratching Post will be distributed monthly throughout IPMS. By-law updates: The process for by-law revisions was discussed. Member suggestion will be sent to Brent, and the Executive Board will give serious consideration to all suggestions. A committee of general club members will be assembled to approve any changes. Interest Survey: The Interest Survey will be re-administered to the club members at the January meeting in order to determine their current priorities and to include new members’ interests in the club. The survey will be edited to include work days at HobbyTown as an area of discussion. The survey is intended to allow all members to have input in the direction of CASM. Officers: Ken thanked the outgoing officers for all of their work over the past 2 years, and welcomed the new officers into their positions. HobbyTown: As CASM was meeting in the new HobbyTown location during its grand opening, Ron Leker expressed thanks on behalf of HobbyTown to all of the club members that helped move the store. He also explained that rather than having gift cards for the drawing, all club members would receive $10 off any purchase of $20 or more to celebrate the grand opening. Members were invited to stay after the meeting to work on models, and answer questions of anyone that may be shopping in the store. Lexington Project: Lloyd King shared with us that the Lexington project is almost complete, and we will be notified a couple of weeks before it is open. T-Shirts: There were a few extra CASM t-shirts from the order the club had placed before the show. The shirts were available for purchase at the meeting for $25. We need to have 36 paid for before another order can be place. For more information, contact Ken. Business Cards: CASM has new business cards. Be sure to pick up some to give to potential members, vendors, advertisers, etc. December Meeting: The December CASM meeting has been moved to Dec. 1 due to a scheduling conflict at HobbyTown, Also, the next group build is due at that time. The theme for the group build is “Bring a Finished Model.” Ken specified that models should have been built during 2012. IPMS Membership Incentive Program: IPMS will give 5 kits to CASM for each member that joins IPMS for the first time, and 3 kits for each member that rejoins after 5 years of non-membership. 1 of these kits will go to the club member. If you have joined or rejoined IPMS recently, contact Brent Bristow or Ray Smith to follow up on this program. Club Dues: Membership dues need to be paid by December, and David Wassell reminded everyone that you can now pay using PayPal. Dues are $15. Demos: Rick Knapp is putting together a demo schedule for upcoming meetings. If anyone has any ideas, or wishes to volunteer to do a demo, contact Rick. Sproo-Doo 2012: The annual Sproo-Doo was held on Oct. 6 at the Arkansas Health Center. Attendance: There were 33 participants with 127 models, which was down slightly from last year, which had 47 entrants with 140 models. There were a large number of out of town (state) and non-member participants that joined us, and the vendors reported that they did very well. Everyone felt that most of the entries were of high quality work. It was agreed that we needed more club members to participate in 2013. Venue: David Stillwell said he thought that the lighting was the best we have had. 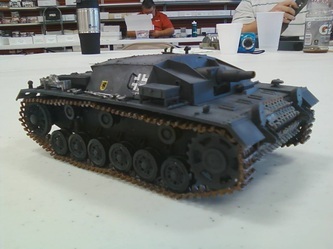 Most members agreed it was well suited for our needs, although the location may present an issue with Junior Modelers, who are dependent upon their parents for transportation to participate. Steve Wilson suggested we hold a Juniors only contest at HobbyTown on a different date. Raffle/Silent Auction: Cliff Bullock suggested we clarify raffle ticket sales for next year (i.e. 6 tickets for $5). Everyone thanked Cliff for his efforts with getting raffle and silent auction items, and he has told us he has already started getting donations for next year’s show. Sproo-Doo 2013: Brianna informed us that next year’s Sproo-Doo will have to move to a different weekend due to the IPMS Region 6 Contest being held that same weekend. She also reminded us that we need to start lining up vendors for next year. Ken told us that John of John’s Models will be unavailable next year, which leaves a large spot to fill. 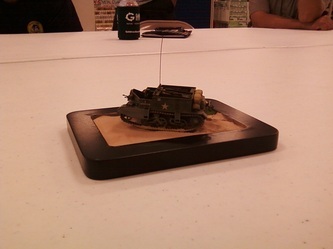 Matt Bond presented a British Universal Carrier Mark II made by Tamiya. 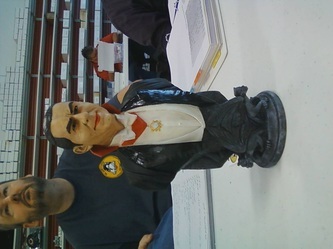 Brent Bristow presented a Bela Lugosi Dracula bust and the sponges used to create the stone effect on the base. 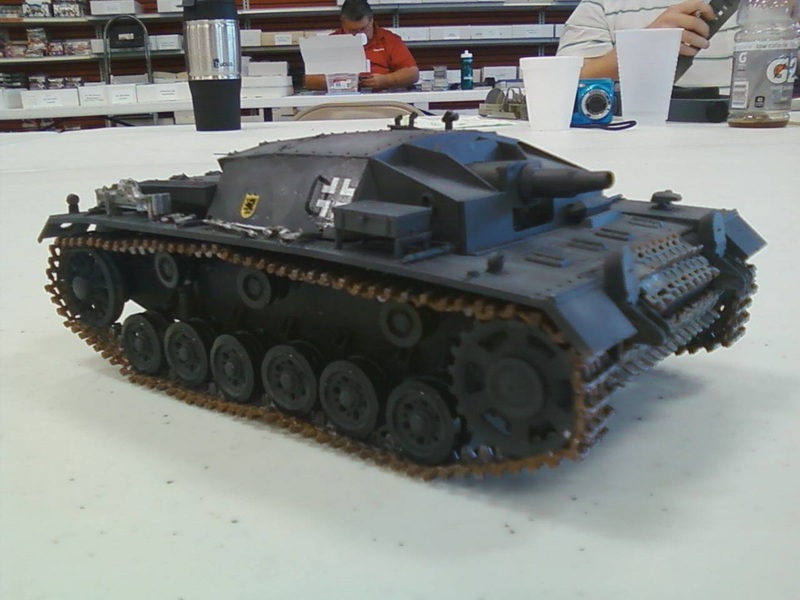 Cliff Bullock presented a Stus III Ausf. C/D, Sd. Kfz. 142. 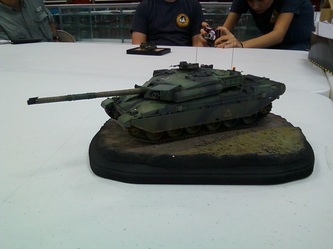 David Stillwell presented a Tamiya 1/35 Challenger 1. Garrick St. Pierre presented a WIP of a Citation aircraft he is restoring. He also reminded everyone that he has 400 aircraft at the Cloverdale school that he needs help restoring. Ken Faussett presented a 1941 Ford Woody he intends to build. Ron Leker presented a Striker Ambulance WIP, along with a USM Lav-25 “Piranha” and a Warhammer Space Marine Stormtalian Gunship he intends to build. Rick Knapp presented a Tri-Star 38d Model B WIP. John Erwin offered the group a large number of clear plastic trays from his work that can be used for mixing paints. Thanks, John! Meeting was adjourned at 11:15.